Plate tectonic activity is being observed presently on a historic timescale, especially in the form of volcanic eruptions and earthquakes, but, as with many large-scale Earth science phenomena, it is hard to appreciate the process within the short span of human history, particularly during the small part of history during which we've been keeping records and mapping tectonic activity. For this reason, an Earth history approach complements the traditional process-oriented approach of physical geology courses. Modern geography: Our oceans, continents, and mountains are all direct products of plate tectonics, and most other large features, such as big rivers, are indirect results. Earth hazards: Active volcanoes and earthquake-prone areas can be monitored in the present day, but an Earth history approach provides a longer baseline from which to make predictions. For example, if a glaciated volcano looms over a human community, we need to examine the deposits on and around the mountain to determine the paths taken by lahars (dangerous mud flows) during the last eruption, and avoid building there, as those paths are likely to carry lahars again when the volcano next erupts. Mineral resources: Many valuable minerals and useful rocks are the products of intrusive magmas, and their abundances and distributions are determined by past plate-tectonic activities. Outgassing: Even today, major volcanic eruptions disrupt weather for years at a time. 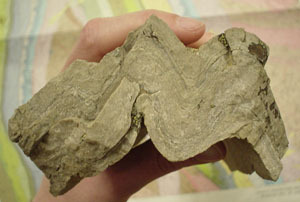 Previous cold years are often visible in lake sediment records, as are volcanic ash layers. Over the long term, plate tectonics has been the major contributor of gases to the atmosphere and plays an important role in determining its composition. One example of a course written around the plate tectonics theme is Processes and Concepts of Geology ( This site may be offline. ) at Wooster College, which emphasizes the development of the solid Earth. Below are web resources specifically relevant to plate tectonics.